Bison Machine are to release new album ‘Hoarfrost’ on 10th July 2015 via Kozmik Artifactz/Bilocation. Worshippers of volume, Michigan based Bison Machine have gained a reputation for their frenzied, high velocity live shows, welding Graveyard and Pentagram influenced shuffles onto the back of 70s Motor City rock and 90s stoner grooves. 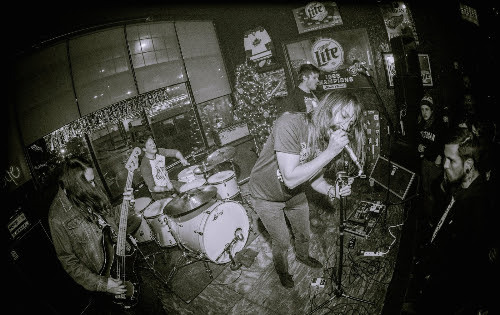 If you’re a fan of pounding, colossal blues and heavy Zep-driven riffs then the Hamtramck four-piece’s gnarled and muscular guitar and vocal work on tracks like ‘Cosmic Ark’, ‘Gamekeeper’s Thumb’ and ‘Viking Hand’ will leave you floored, broken and bloodied. ‘Hoarfrost’ will be released on CD and limited, high performance 180g vinyl on 10th July via Kozmik Artifactz/Bilocation Records.